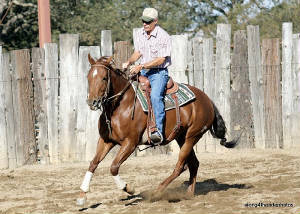 Building a strong foundation for you and your horse through our training program. Our kind, yet firm approach gives the horse confidence in his rider and his surroundings. Training horses for the real world. 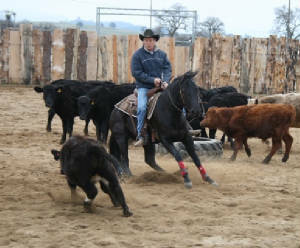 Our horses get lots of all-around experience on trails, in the arena, and with cattle. Horses are started with gentleness and firmness to get the best result for the horse. 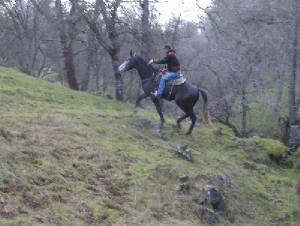 Horses are ridden in the foothills, used to move cattle and also ridden in the arena and under a variety of circumstances. The well-being of the horse and rider are a top priority, and getting the horse used to a variety of tasks including opening gates, moving cattle, working in small corrals and working on the ranch are all important parts of the horses education. We get horses moving and using themselves to their best ability. We work with horses and riders to best meet their needs and desires for their riding and training program. Schooling on cattle in the cutting pen. Steve giving a young horse "trail time". We often see a horse and rider in conflict. We work with horse and rider to turn conflict into cooperation.